The stock of Daughter has risen considerably over the last couple of years, and their debut album, 'If You Leave', comes with considerable anticipation and expectation. Daughter have grown from simply being the musical moniker of Elena Tonra to a trio with a formidable reputation, both on record and live. 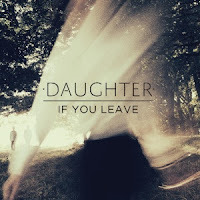 'If You Leave' is an assured debut, albeit one that is somewhat overbearing with its melancholy. The album opens in a curiously off-kilter manner - the intro of 'Winter' proving surprisingly disorientating. The production style across the record is similarly curious, enveloping the listener when perhaps a more stripped back approach would have provided a more appropriately fragile perspective. However, the production does wisely maintain Elena Tonra's soothing vocals at the record's forefront, allowing the heartfelt lyricism to shine through. The resonant 'Youth' is a particular highlight, with such emotionally charged lines as: "And if you're in love then you are the lucky one. Most of us are still bitter over someone." The nature of the record is largely downbeat although there are moments that are rousing, such as with the shimmering guitars and crashing drums of 'Tomorrow', and the more upbeat tone of the percussive 'Human'. Much of the latter half of the album, in fact, is slightly less downcast - a welcome change of tempo and mood, no matter how subtle. There is an obvious beauty to the craft of Elena Tonra, Igor Haefeli, and Remi Aguilella, coming together almost perfectly on the final song of 'If You Leave'. 'Shallows' is effectively a catharsis for the emotional turbulence of much of the rest of the album, thankfully freeing the listener to explore their own emotions. Unfortunately, 'If You Leave' doesn't quite get the balance right, often breathtaking yet overly consumed by its deeply melancholic ambience. 'If You Leave' is available to purchase at amazon.co.uk. Find more info at ohdaughter.com.